It's a great day!! My largest, and last, UFO is done!! Pieced Fall 2013, it was one of the Quilters Club of America's numbered Mystery Quilts, MQ9. It's official name is "Tranquility" but with all this red, mine isn't tranquil! I'm calling mine Apple Maze. It's big--the first quilt I've made that has a great hang over on each side of a queen size bed. It's long too. The photo above just shows a portion of the quilt. Here's a detail of a couple of the pieced and appliqued apples in the borders on each side of the quilt. 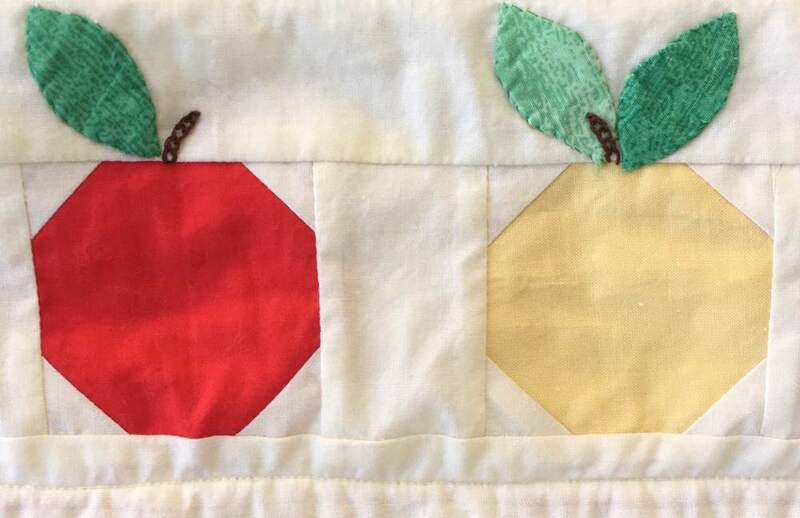 I think these apples are my favorite part of this quilt, though I really like apple quilting too! I'm SO happy it's finally done! !